I'll have to admit to following the hype for this book. It seemed like everywhere someone was raving about it, so I ordered it. Dimple is an interesting character. She's original, but maybe too original, to be honest. Dimple is trying hard to break out of the stereotype her Indian family has kind of made for her. She wants to go to college, not get married. She wants to choose her own life and not have it chosen for her. So, Dimple's parents agree to let her go to a camp that will help her do just that. What she doesn't know is that her parents have set it up for her to meet Rishi while she's at this program. Like I said, Dimple is determined to get out of this mould she's been put in. She doesn't wear makeup or contacts or color. The fact that she continuously talks about how she's against those things gets a little annoying. Rishi is fun and optimistic. Even though his first meeting with Dimple goes terribly wrong, he's still hopeful. He decided to stay in the program and the two of them are assigned to be each other's partners. What could go wrong, right? Their relationship is cute and sweet. The way that Rishi doesn't care what anyone else thinks about him is empowering and what makes Dimple fall for him, even though she's reluctant to do so. 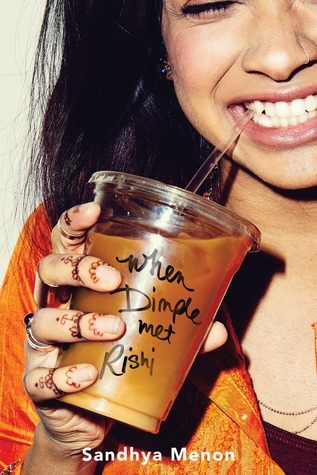 Dimple doesn't want to lead Rishi on, but she also has strong feelings for him. Her inner voice is either swooning for Rishi or pushing him away. I do love the diversity and the immersion into the culture of these characters. They alternating POVs were an interesting part of the story. Sometimes it helped, but sometimes it got confusing. All in all a cute story.